The gate valve is a shutter of the opening and closing member. The direction of movement of the gate is perpendicular to the direction of the fluid. The gate valve can only be fully open and fully closed, and cannot be adjusted and throttled. The gate valve is sealed by the contact between the valve seat and the gate. Usually, the sealing surface will weld the metal material to increase the wear resistance, such as surfacing 1Cr13, STL6, stainless steel, and the like. The gate has a rigid gate and an elastic gate. According to the gate, the gate valve is divided into a rigid gate valve and a resilient gate valve. This valve has not changed much in the past 100 years, but this gate valve plays an important role in the production facilities of refineries, chemical plants, power stations and industrial enterprises around the world. The most common type of valve in fluid control valves in the world is the gate valve - the opening and closing valve in the fluid control process. These valves are found in every refinery, chemical plant, power station, and industrial enterprise production facility and can range in size from 1/4" to 144". The main purpose of the gate valve is to cut off the flow. For this reason, gate valves are often referred to as "cut-off" valves or "blocking" valves. The advantage of using a gate valve is that it provides an almost unobstructed flow of media in the open position. Among the many common valve types, only the full-opening ball valve is comparable to the flow capacity of the gate valve. The symmetrical design and the equivalence seal allow the gate valve to intercept the flow of the medium from either of two directions. Gate valves can also be made from a variety of materials. 1/2-inch small bright brass faucets can be found on hardware store shelves, and rare high-alloy gate valves can be found in nuclear power plant installations. Due to the potential risk of damaging the seat sealing surface, the gate valve cannot be operated in a partially open position or the gate valve can be used for adjustment purposes. Why is this damage? Because when the gate valve is partially opened, the closing element (gate or wedge) of the gate valve will oscillate between the two seats, and scratches will occur, which will affect the sealing of the seat. In appearance, most of the gate valves look similar. However, the interior of the valve has a variety of different design structures. Most gate valves consist of a valve body and a valve cover that contain a closing element shutter or wedge. The closing element is connected to the valve stem and passes through the bonnet and finally engages the hand wheel or other valve stem operating device. The pressurized packing material in the stuffing box is subjected to pressure around the valve stem. Although the material of the gate valve can be various metals from aluminum to zirconium, it can also be a large amount of engineering plastics. But the most commonly used materials are steel, iron and bronze. Bronze or brass has excellent machinability and lowest cost. 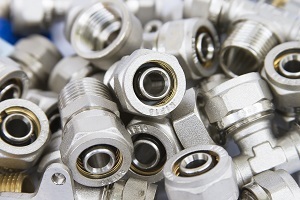 Because of its low strength and softness, bronze is easy to process, and the valve of this material is only suitable for low pressure applications. 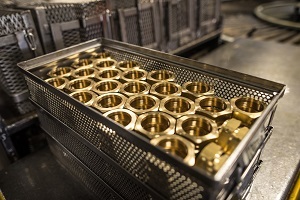 Bronze valves are primarily used in water and equipment lines at pressures of approximately 300 psi or less. The strength range of the iron valve is between the medium bronze and steel. Iron is more difficult to machine, but cast iron is relatively easy to cast. Iron valves are usually available in two materials: grey cast iron and malleable cast iron. The high carbon content and good rust resistance of iron valves make iron valves more suitable for underground applications than steel valves. For industrial valves, steel materials range from the lowest grade "WCB" to the chromium/molybdenum alloy steel. Unlike brass, bronze and iron, most low-alloy steels have weldability, which makes steel valves easy to repair and weld, and in some cases easier to manufacture. The gate valve can also be made of a rare alloy such as titanium to zirconium. Safety Valve & Fittings is a professional manufacturer and exporter of valves, fittings and flanges.